The exclusive Pretty Beach House tucked away in a bush paradise is perfect for romance, writes Bellinda Kontominas. IT’S 7am and way too early for anyone without children to be awake on a Saturday. But I can’t help sliding out of the plush king-sized bed and pulling open the heavy curtains to reveal the magnificent sight outside. We are among the treetops of hundred-years-old angophoras and surrounded by eucalypts, ferns and palms that stand just beyond the sliding glass doors of our bedroom. It’s a bush paradise where lorikeets feed in the branches above and friendly eastern water dragons come to visit, hoping some fruit might be thrown their way. The Treetops Pavilion is one of three one-bedroom suites that form the Pretty Beach House, a private guesthouse part-owned by John Singleton and perched on an escarpment in the Bouddi National Park, high above Brisbane Waters. The pavilion has two storeys, with a living room with combustion fireplace on the upper level, which opens to a vine-covered balcony with views over the three-hectare property. There’s also a bathroom upstairs with glass doors to the balcony, so you can gaze out at the greenery while under the divine rainfall shower. Downstairs, the bedroom has an en suite and dressing room, opening to a private sandstone patio with a heated plunge pool and day bed. Rich leather chairs, woven mats and neutral tones throughout ooze understated elegance while the bed, made from the timber of a scribbly gum, brings a piece of the bush indoors. The result is a very romantic setting. “It’s a place where couples come away to get together,” the house manager, Marita Said, says. It’s also a place where you’re guaranteed to indulge the taste buds, thanks to the fine menu by renowned chef Stefano Manfredi (whose restaurant at sister property, Bells at Killcare, is five minutes down the road). 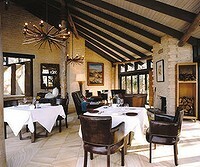 Guests are encouraged to dine wherever they want within the property so we choose a different location for each meal. We eat pre-dinner appetisers of salt cod polpettine and gorgonzola turnovers in the bar, served by our butler Haydn Moyes, while Marita recommends we try an Italian blend, Pieropan Soave, from the cellar below. Dinner is in the richly furnished atrium dining room, with a fireplace, soaring ceilings and huge paintings by the cartoonist Bill Leak. We’re treated to entrees of pan-fried scallops on soft polenta with wild hops and caper salsa and grilled, spiced quail with fregola and zucchini trifolati. It’s followed by grilled mulloway fillets, salsa piccante and peas (my husband opts for the aged beef loin with horseradish and red wine sauce, which is sweet and tender). But it’s the raspberry pistachio and vanilla cassata that is the true hit of the evening. Breakfast the next morning is served in the sunshine on our private patio, overlooking the plunge pool. We choose a selection of pastries, a fruit plate and the Beach House specialty of eggs fried in sourdough crumbs, which is filling on its own. We laze about reading newspapers on the day bed before hopping into the plunge pool. Then it’s over to the main house for lunch on the deck by the main pool. Marita erects a large sun umbrella to protect us from swooping kookaburras. Plates of antipasto, octopus and calamari, and exquisite oysters from the Hastings River and Pambula are among the dishes, accompanied by beer and fine wine. Full-bellied, we head off on a bushwalk via a marked trail at the back of the property to Tallows Beach, about 30 minutes’ walk. Marita has offered to provide a guide but when we decline she packs us a backpack with beach towel, water bottles and trail maps. It’s this level of service that sets Pretty Beach House apart. When my husband suffers from hayfever, Marita brings him nasal spray from the chemist. We say we love the home-made breads at dinner; they are kept coming. We suffer an attack of the munchies late at night; the kitchen is open round the clock. Guests expect the best and pay accordingly. Chartered boat trips (from $2000 for four hours) or game fishing (from $4000 for eight hours) are available. Every request is met with a smile. When one guest insisted at 7pm on a Saturday that Marita find someone to play the bar’s baby grand piano, she delivered. “That wasn’t easy but we managed,” she says. 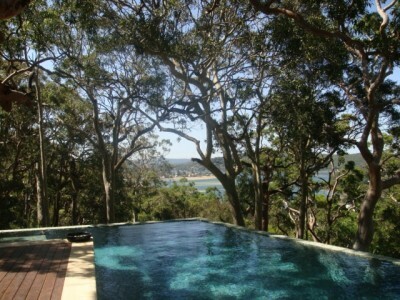 The writer was a guest of Pretty Beach House and Destination NSW. Where Pretty Beach House, 83 High View Road, Pretty Beach. Getting there On the central coast, about 1½ hours north of Sydney via the F3 freeway. How much The Treetops Pavilion is $2500 a night (minimum two-night stay) or $2750 a night during peak season (Easter and Christmas, with minimum three-night stay). Style statement Elegant bush retreat with water views. Perfect for Lovers of nature who appreciate the finer things of life. Don’t forget To pack your swimmers. Each pavilion has a heated plunge pool for year-round swimming plus there’s a main pool, which was ocean temperature when we visited. Shame about The bugs that find their way into the bathroom if you leave the lights on overnight. Kudos For the his-and-hers Havaianas that fit perfectly, the bespoke scented soaps and hair products and the 3000-song iPod in the bedroom. Take the kids Only if you’re prepared to book out all three pavilions.